At Kiss the Cook, we carry thousands of products and gadgets, most of which we vet and try, and many of which we love. So trying to narrow down some of our favorites is kind of like picking a favorite child. Here are a few of the most popular items in our store that are also some of our favorites at home. It seems like kale is more popular than ever. Cooks everywhere are finding plenty of ways to unlock its flavor and enjoy its health benefits. You’ll find it in salads, eaten as “chips,” whipped up into tasty smoothies, and more. If you’ve ever cooked with kale, you know its delicious leaves grow off a stem or central “rib” that needs to be removed. The process of removing the leaves from the stem (I’ve heard it referred to as “stripping” or “deveining”) can be a little tedious. The Looseleaf Kale & Herb Stripper by Chef’n was designed specifically to make this process easy. It’s a simple little tool with various-sized holes; you just pull the kale through the hole and the leaf separates from the rib. 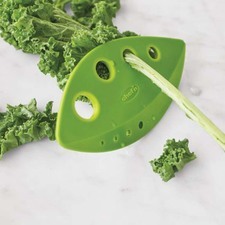 A number of companies have recently launched “kale stripper” gadgets, but the Looseleaf is my favorite. The different-sized holes mean you can also use it to strip chard or other greens, as well as rosemary and other herbs. It also has a side that comes to a sort of edge—not sharp enough to cut you, but sharp enough that I’ve used it to shred the leaves up after stripping them. This simple little tool may not look like much, but it’s multifunctional, easy, and fun to use, and it can definitely come in handy if you’re someone who enjoys eating kale! 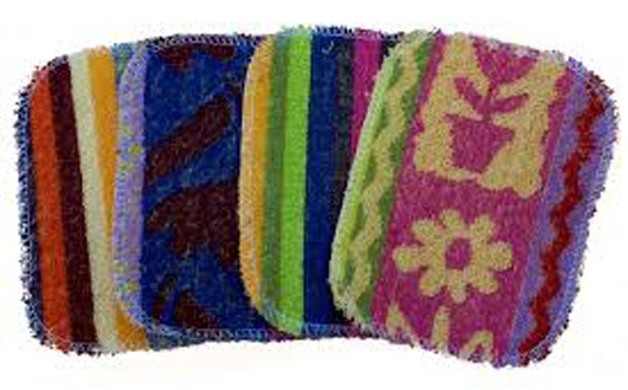 And while I can’t say that the Euroscrubby makes washing the dishes fun, it certainly makes it a lot easier. This little 3x5-inch piece of fabric can only be described as magical. It somehow manages to be simultaneously very abrasive and gentle. Use it to scrub the toughest messes or to clean off a glass cooktop without leaving a scratch. 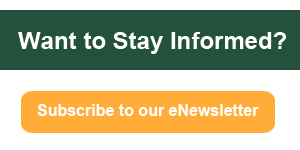 (Yes! You can use it on ANY surface). I love to cook with cast iron, and my Euroscrubby and hot water get my pans clean— and without stripping the seasoning from the pan. Another nice feature? When it gets dirty or grimy, just toss it in the dishwasher, and it’s good as new. Ours tend to last six months or more! They also come in all sorts of bright colors and patterns; I don’t know if that matters to anyone, but I like it! We typically tell people that if they are going to have only one knife, it should be an 8-inch cook’s knife. The cook’s knife is designed to be useful for a wide variety of kitchen jobs, and the 8-inch blade is typically going to be large enough to do just about any job you need to do. Honestly, as much as I like my 8-inch knife, I find myself reaching for a 6-inch blade more often. While the 8-inch might by my favorite, my Wüsthof Classic 6-inch Cook’s Knife is the one I use the most. Its 6-inch blade is a little easier to control for a recreational cook like myself, and because it’s a forged knife with a full tang, it has great balance and weight. Most commonly I’m chopping veggies or smaller items, and this 6-inch knife is perfect for almost any job! We still stand by the recommendation that if you’re going to have just one knife, it should probably be an 8-inch cook’s knife; however, you should probably have more than one knife. 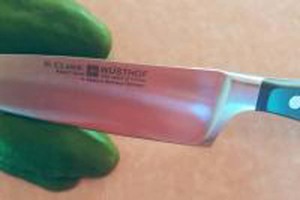 Realistically, no matter how many knives you have, if you have the Wüsthof Classic 6-inch Cook’s Knife, it’ll likely become your most useful knife and the one you reach for most often. Another reason you may want this knife? Wüsthof has it on promotion this year at an incredible price. Typically priced at about $110, it’s on sale through 2016 for $59.99. We all love popcorn. It’s a simple, classic snack enjoyed by generations of children and adults. There are lots of ways to make popcorn, but recently we’ve discovered the joys of using the Zippy Pop Snack Maker. 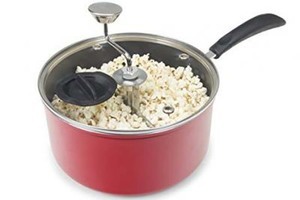 For simply making popcorn on the stove, it works great. Heat up a little oil, add the kernels, and slowly turn the handle. A few minutes later, you have light, fluffy hot popcorn, and perfect snacking on a long, cold winter evening. But it’s what you might like to add to your popcorn that really sets the Zippy Pop apart. If you like your popcorn simple, you can just add salt and maybe some butter, and its multi-layer “tumbling mechanism” ensures that whatever you add gets mixed in thoroughly and evenly. However, there are dozens of recipe ideas. Satisfy sweet-tooth cravings with chocolate, caramel, and coconut mix-ins, and those who prefer their popcorn savory can add their favorite cheese and spices. Party mix is easy too, allowing you to roast nuts and combine ingredients in one simple step—a great tool for this partying time of the year. The non-stick finish combined with the previously mentioned mixing mechanism makes blending things like chocolate into popcorn really easy (and even easy to clean up after)! What’s exciting about a lid? Well, let’s start with the practical. These BPA-free silicone lids are designed to cover bowls, pots, and casserole dishes, and they provide an airtight seal. Airtight, as in complete suction, to the point that you can lift a bowl by just the lid. This allows for great leftover storage of and for transporting dishes. And it reduces your use of plastic wrap and tinfoil, eliminating waste and some frustration, and saving money in the long run! The lids can safely go in the microwave, be used on the stovetop, and go through the dishwasher. They come in a variety of shapes and sizes, round lids ranging from 6 to 13 inches in diameter, for every size bowl, as well as square and rectangular lids. Now here’s the fun part. The lids come in a wide variety of colors and patterns. The most popular are flowers (sunflower, daisy, hibiscus, poppy, and more). There are snowflakes, pumpkins, and maple leaves, truly something for every season and occasion! Bringing a salad to a potluck dinner? Toss on the sunflower or daisy lid for transport and really dress that salad up! Use the strawberry or blueberry lid for your fruit salad, or cover your pumpkin pie with festive autumn leaves. Perfect!